Also in the mag this week, Chloe Madeley gets candid about getting drunk with her mum, Jo Joyner’s confessions about being nosy and the lies of loved ones, Olly Smith lets us in on his showbiz life, and we have a good old gossip with Caroline Flack! PLUS, remarkable real life stories, discover great value fashion on the high street all for under £30, beauty game changers that will become your new every day must-haves, and the easy smoothie diet to help you lose up to 3 pounds a week! We reveal the truth behind the bacteria in your house that could be making you ill, recipes for the perfect picnic, amazing supermarket deals, and our smart shopper is back with amazing money saving tips for mums. 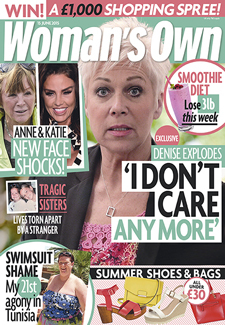 All this and more in the latest issue – pick up your copy of Woman’s Own this week!